The White Russian is among the best, easiest, and most popular vodka cocktails you will come across. It is incredibly simple—just vodka, coffee liqueur, and cream. Without a doubt, this is a drink that every bartender should know and every drinker should taste. The creamy counterpart to the equally famous black Russian, this recipe stems from a couple of cocktails that were a hit in the 1930's. It was not until the early 60s that the "white" and "black" Russians were written down in bartending guides. Since that time, there has been no stopping either drink. What's not to love? You get vodka accented with the taste of coffee in a luscious, creamy cocktail. It's a very approachable drink and one that is a good introduction to the cocktail world. In fact, it's so delicious that one can barely notice there's alcohol in it and this has only fed the drink's popularity. Enjoy a white Russian after dinner, during happy hour, or anytime you're looking for a quick and delightful drink. Pour the ingredients into an old-fashioned glass filled with ice. Add any other additional ingredients (see below). There are a number of vodka cocktails that are very similar to the white Russian that you may also want to try. You can even transform the white Russian into a frozen ice pop if you like. It's a fun recipe to play with, so use it as inspiration. Brave Bull - A black Russian with tequila. Colorado Bulldog - Add cola to create a sort of root beer float feel. Dirty Bird - Give the white Russian a quick shake at the end. Dirty White Mother - Switch the vodka out for brandy. Mudslide - Skip the cream and pour Irish cream liqueur instead. Smith & Kearns - Skip the vodka, switch from cream to half and half, and add club soda. Keep the vodka for a Smith & Wesson. Sneaky Pete - Replace the vodka with rye whiskey. Test your bartending skills and float the cream on top of the spirits and ice. It may require a bit of practice to get a clean layer, but it makes for a great looking drink. Serve this with a straw and allow the drinker to stir the ingredients as they like. The biggest question with the white Russian is which vodka to use. The simple answer is: whatever you like. Better yet, if you're looking to save money in your home bar, this is the ideal drink. There are many great tasting and inexpensive vodkas available to choose from. This is not a vodka martini and the heavy flavors of the other ingredients will disguise any impurities in the vodka used. Go ahead, save a few bucks and feel free to use your favorite "well" vodka for this drink. The white Russian is the perfect mixed drink for flavored vodka experiments as well. By starting with an infusion of strawberries or raspberries, you can add a fruity dimension to make the drink really interesting. This is also a good use for those delicious cake and whipped cream vodkas, espresso, chocolate, and vanilla vodkas are also great choices. Kahlua is the most popular coffee liqueur used in a white Russian. Yet, there are many other options available. Give the coffee liqueurs from Firelit, New Deal, or Leopold Bros. a try. You'll be surprised at the difference and one may permanently replace Kahlua in your bar. Remember, just because it's the most common, doesn't mean it's the best. Some white Russian drinkers will also switch the liqueur completely. Amaretto is a popular option and if you go with that, then you have actually made a roasted toasted almond, not a true white Russian. The drink's cream seems like another easy ingredient, though you do have a few options here as well. Heavy cream is a popular choice because, though it is thicker, only a small amount is used in the drink. 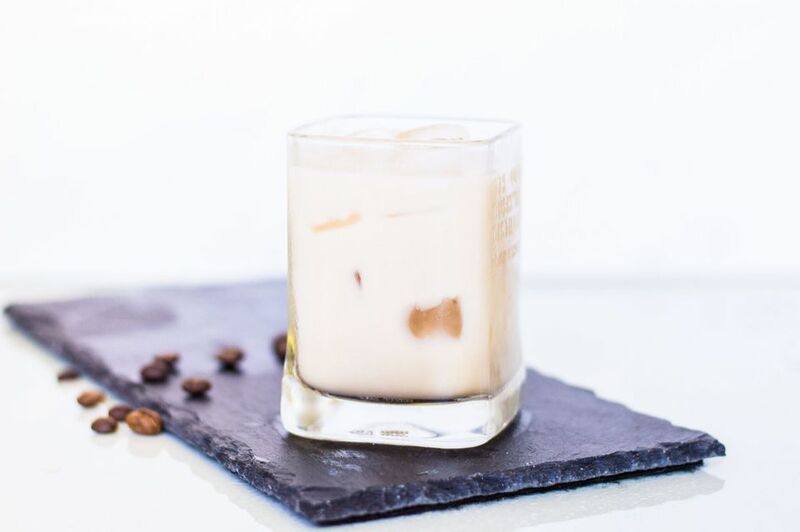 It actually becomes lighter as the ice melts while giving the white Russian a lush texture. Light cream and half and half are both good prospects, too. Some drinkers will use whole milk for the simple fact that more people stock milk in the fridge than cream. However, milk tends to produce a rather thin a drink. If you prefer (or need) to avoid dairy, a perfectly good drink can be made with any dairy alternative. Soy, almond, rice, or any of the other "milk" can be used. No matter which cream you choose, make sure that it is fresh or you will just be wasting liquor. Check the expiration dates before you pour. How Strong Is the White Russian? If we were to use an 80 proof vodka and mix the white Russian according to the recipe above, it would be approximately 24 percent ABV (48 proof). Even though it will mellow a bit as the ice melts, it is a deceptive cocktail and a little more potent than you may think, so take it easy.